Camden People - Dr. David Helm Jr.
DR. DAVID D. HELM JR. was born in Camden NJ on May 31, 1895 to David and Barbara Helm. The Helm family had been in Camden as early as 1867. David Helm Sr. was a butcher, and his grandfather, Charles Blaine, was also a butcher was his uncles Harry and Walter Helm. 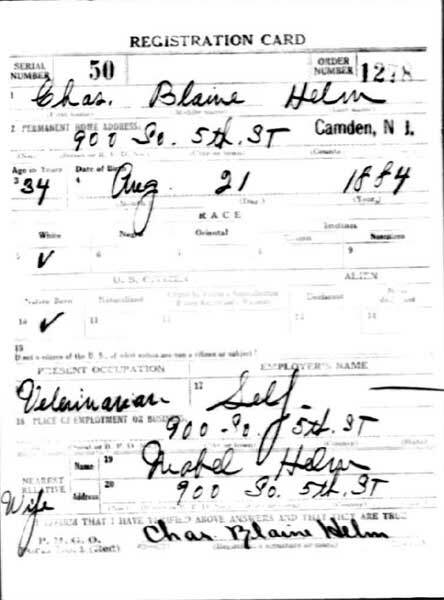 The David Helm family lived at 413 Walnut Street in Camden at the time of the 1900 Census, Harry and Walter Helm lived next door at 415 Walnu. Grandparents Charles and Louisa lived at 31 North 3rd Street at that time, along with five adult children- daughters Mary Clara, and Emily; and sons Joseph and George, who also worked as butchers in the family business. Another son of Charles Helm, Dr. Charles Blaine Helm, appears to have been away at school at that time. 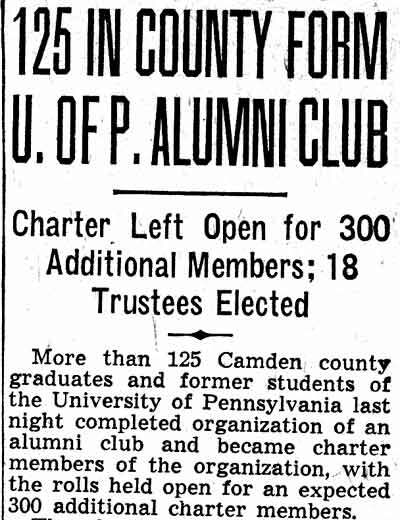 He would become a veterinarian in the city of Camden, serve as the city's purchasing agent in the 1920s, and also was the co-owner of the 1919-1920 Eastern Basketball League championship team, the Camden Crusaders. 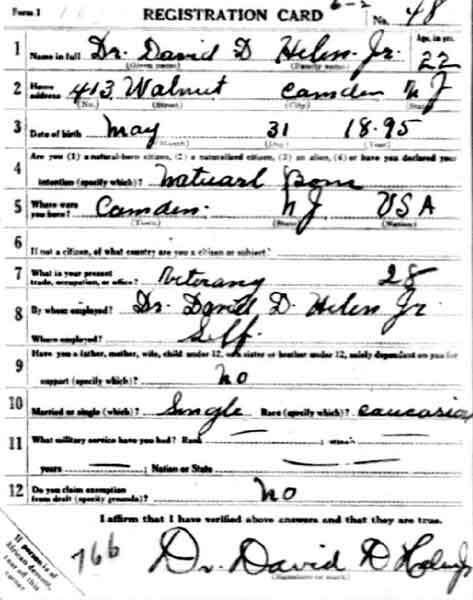 When he registered for the draft on June 5, 1917 David Helm had received his doctorate. he was still single, and still lived at 413 Walnut Street in Camden. 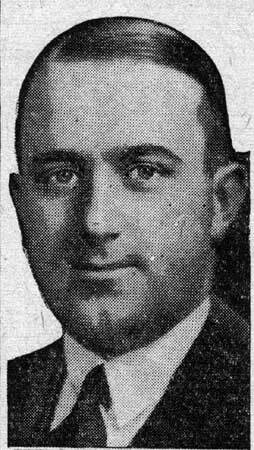 David Helm married around 1924. 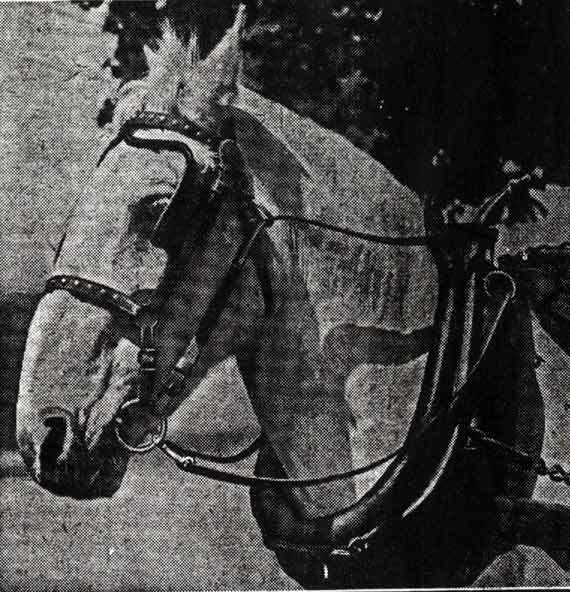 His wife Lizzett soon bore a son, Albert Harry, late in 1925. 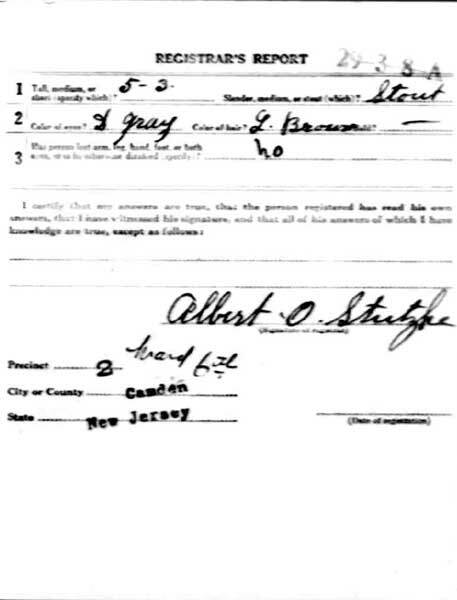 When the census was taken in 1930, Dr. 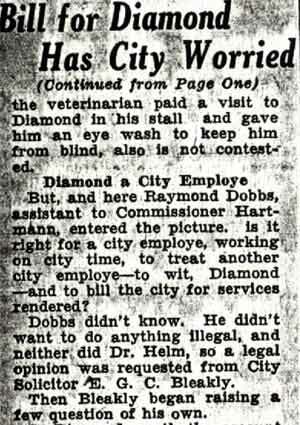 Helm was working as the health inspector for the city of Camden. The family then lived at 514 Spruce Street. The family was still at that address in 1947. By this time Dr. 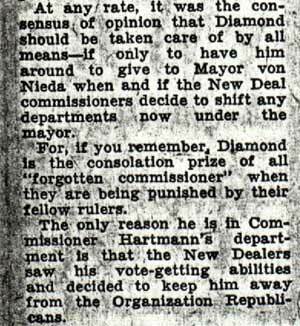 Helm held the title of Director of the city's Board of Health, a title previously held by Dr. Arthur L. Stone, who had passed in 1945. 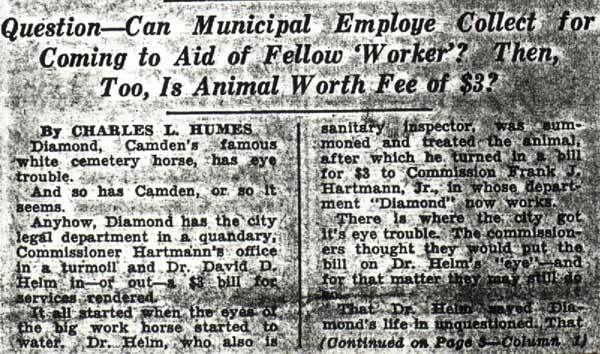 As director of Camden's health department, Dr. David Helm added pertussis and tetanus immunization to the city clinics and school program and eliminated rabies from the area, through rigid control of stray dogs. He wporked closely with long-time health department clerk Lewis Lee. Dr. 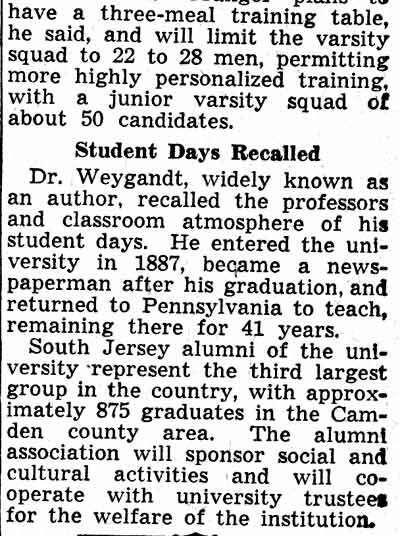 Helm appears to have moved to Audubon NJ by 1956. His son followed him into medicine. Dr. Albert Harry Helm was assistant cardiologist at Cooper Hospital in the mid-1950s. 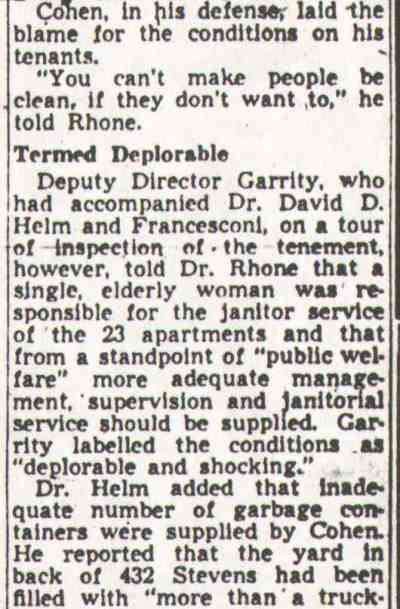 Two girl employees of the RCA Victor Company who are among nearly 100 persons suffering from ptomaine poisoning as the result of eating from "box lunches." Miss Clara Schaeffer, left, of Gloucester, and Miss Violetta Brown, Brooklawn, were confined to their beds at their homes last night after receiving treatment at Cooper Hospital. Nearly 100 Camden factory and shipyard workers were poisoned yesterday after eating food contained in box lunches. More than 60 of the workers, stricken at their machines in. the RCA Victor Company plants, were rushed to the company's dispensary and local hospitals. Many are reported in serious condition. At the New York Shipbuilding Company others became ill after partaking of the lunches. Four are in West. Jersey Homeopathic Hospital recovering from the effects of the poisoned food. At least three more were stricken at the leather plant of the John R. Evans Company, Second and Erie Streets. 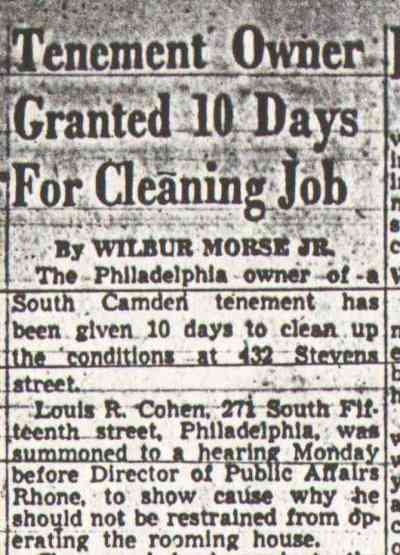 In Philadelphia more than a score of laundry workers were carried to physicians and hospitals, all said to be victims of contaminated foods. Physicians believed all would recover. 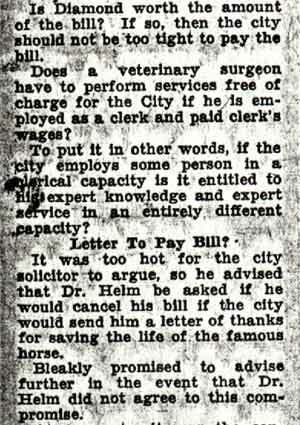 Dr. David D. Helm, city sanitary inspector, believed the ptomaine condition resulted from the eating of egg sandwiches. Dr. Helm, along with Sergeant Rox Saponare and detectives, last night questioned Ray Konst, 3313 D Street, Philadelphia, owner of a Philadelphia box lunch concern. 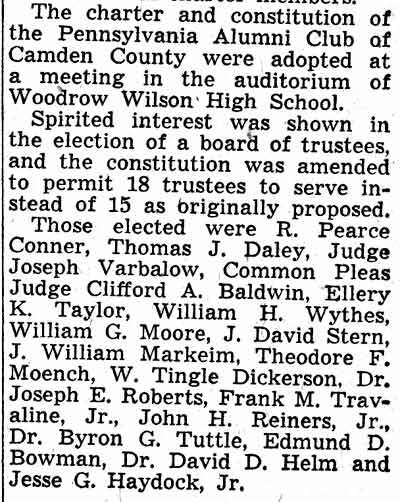 Following the quizzing, Konst was ordered to refrain from further selling of the box lunches in Camden, pending the result of an investigation. He also must obtain complete approval from the Philadelphia Board of Health before being allowed to resume operations here. The boxes, distributed by Konst, are labeled "The Majestic Lunch." Konst declared that never before had complaint reached him as to the quality of his food. 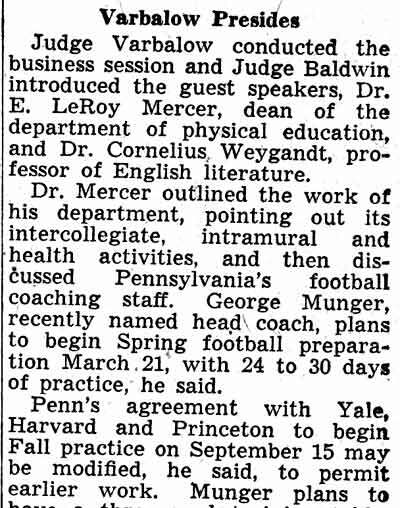 "I have ordered distribution of Majestic Lunches in Camden be stopped," Dr. Helm said, "until the investigation has been completed and the health authorities in Philadelphia to whom all evidence will be given because they supervise this company, give them a clean bill of health." Two of the box lunches have been obtained by police and will be chemically analyzed today by order of Dr. A. L. Stone, city health officer. Konst assured police he would assist in any manner possible to learn the source and nature of the foodstuff causing the illness. 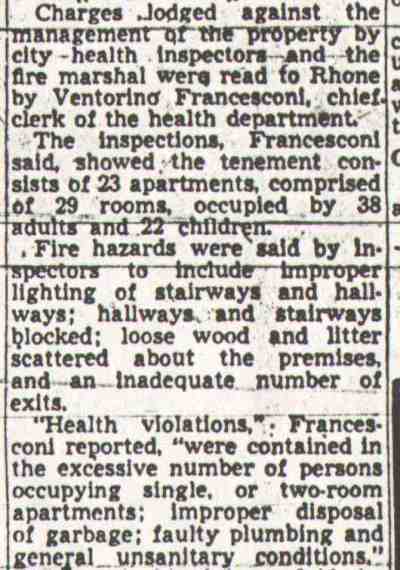 'The first illness occurred shortly after 3 p. m. at the RCA Victor plant. A young woman was overcome after partaking of a glass of water. She was taken to the dispensary where Dr. Reuben L. Sharp said she was suffering from ptomaine poisoning. Within a short time several other girls and men in various sections of the plant were stricken. Some fainted at their machines and had to be carried to the dispensary. Soon Dr. Sharp and his staff of nurses had more than, they could handle. Private automobiles were pressed into service and many of the victims taken to Cooper Hospital, where stomach pumps were used to clear their bodies of the poisonous food. One man, B. H. Poole, 40, of 144 North Sixtieth street, Philadelphia, was admitted and his condition described as serious. Others were treated and sent to their homes, where many were at­tended last night by their personal physicians. Miss Clara. Shaeffer, 19, of 226 South Fifth Street, Gloucester, employed at the RCA Victor, told of the scenes near her shortly before she became ill and was rushed to Cooper Hospital for treatment. "I saw many of the girls running upstairs to the restroom," Miss Schaeffer said at her home, where she is confined to bed, "but paid little attention to them, although several had to be assisted up the steps. "Suddenly I felt sick at my stomach and had a desire for a drink of water. I asked the girl next to me to get me a drink, but she was unable to leave her machine at the time and I walked to the fountain. "After taking the drink everything seemed to whirl about and I thought I was going to faint. I told my foreman and he ordered me taken to the dispensary. "When I arrived there the place was filled and someone took me to Cooper Hospital, where the doctor gave me some medicine and I was taken to my home." Miss Schaeffer said she grew worse after she arrived home and her parents summoned a physician. Others told similar stories of the scenes as worker after worker was stricken. Plant officials said many had fallen where they stood, the ptomaine attack seizing them so suddenly they had no time to summon aid. Konst told Detectives Benjamin Simon and John Opfer that he sells more than 200 box lunches in Camden daily. He has agents at the RCA plants, New York Shipyard and at the leather companies. He also sells more than 500 box lunches daily in Philadelphia. The lunch yesterday was made up of a cheese sandwich, an egg and lettuce sandwich, a piece of apple pie, cupcake and fruit. Some of the lunches contained tuna fish sandwiches. According to Dr. Helm, all of those taken ill had eaten the egg sandwiches, some had partaken of the tuna fish and others of the cheese. One man became ill when he ate half an egg sandwich given him by a fellow employee late in the afternoon. 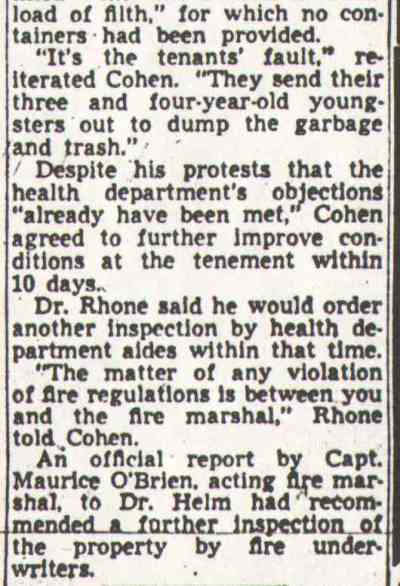 The laundry workers affected were employed at the Forrest Laundry, 1225 West Columbia Avenue, Philadelphia. One of these, John Gilligan, 52, of 1923 East Willard Street, was taken to St. Luke's and Children's Homeopathic Hospital in a critical condition. Police were checking other hospitals to learn if additional victims were unreported. Barbara White, 3136 North Twenty-ninth Street, Philadelphia. Vera White, 825 North Sixth Street, Philadelphia. E. B. Bauers, 1255 Kenwood Avenue. Mary Mossman, 3163 Amber Street, Philadelphia. Anna Cullen, 2124 Memphis Street, Philadelphia. Clyde Lape, 562 Mickle Street . WIlliam H. Scott, 222 Crestmont Terrace, Collingswood. M. E. Wagner, 581 Carman Street. A. Burman, 1466 Kenwood Avenue. Miss M. Brennan, 2141 North Dover Street, Philadelphia. Helen Shevlin, 854 South Fifth Street. Miss Shaefer, 2825 Amber Street, Philadelphia. B. H. Poole, 40, of 144 North Sixtieth Street, Philadelphia. Miss Violetta Brown, 21, Brooklawn. Miss Clara Schaeffer, 226 South Fifth Street, Gloucester. Dorothy Kurtz, 32, of 308 Penn Street. Alfred Shaefer, 42, of 932 Cooper Street. Gertrude Carl, 17, of 820 Brown Street, Gloucester. Peter I. Cassell, 42, of 353 East Cambria Street, Philadelphia. Willard Stipezell, 25, of 3918 Camden Avenue. Frank Di Nardo, 24, of 222 Second Street, Schenectady, N. Y.
Howard Fryer, 42, of 214 Bergen Street, Gloucester. William Shaeffer, 54, Woodbury Heights. Philip Saponaro, 33, of, 422 Evans Street. John Joyce, 32, of 310 Manton Street, Philadelphia. Camden's drive against unlicensed ice dealers last night netted two alleged violators of the city ordinance. 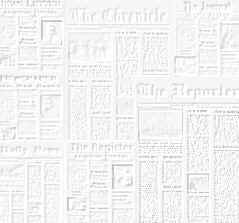 On complaint of Dr. David D. Helm, city health inspector, Alphonso D'Alonzo, 45, of 804 South Fourth street, and Isaac Anderson, 29, colored, of 837 Bridge avenue, were arrested by Policemen Howard Harden and George Clayton. They will be arraigned in police court today. The victims were: William Wagner, 65, of 1554 Forty-eighth Street, Pennsauken township, bitten on leg. 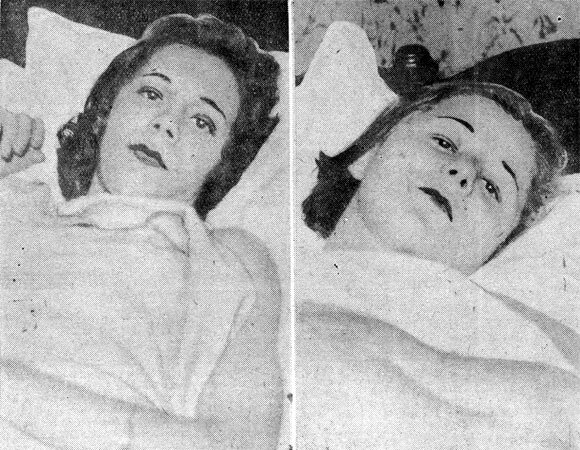 Miss Florence Smith, 19, of 833 Grant Street, bitten on wrist and leg. 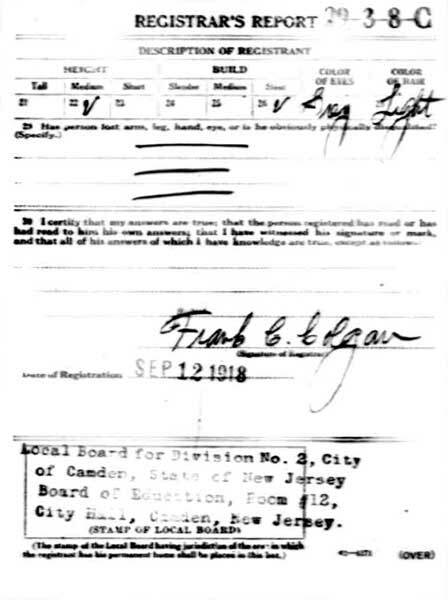 William Luers, 3, adopted child of Mrs. Frank Smith, 833 Grant Street. William Winstanley, 11, of 835 Grant Street, bitten on hands. Thomas Owens, 12, of 631 North Ninth Street, bitten on right forearm and left hand. Dr. David Helm - Frank J. Hartmann Jr.
Camden restaurant licensees yesterday were warned by Dr. David Helm, city sanitary inspector, to obtain 1938 permits by March 1 or face prosecution. Dr. Helm said that while approximately 150 restaurant owners have renewed their 1937 licenses, about 200 have failed to do so. A city ordinance calls for renewals on or before January 1.